Barneys New York was an early adopter of the idea that a retail store should focus on creating an experience for the shopper, rather than simply selling products. In keeping with this approach, Barneys is famous for collaborating with artists and designers on ground-breaking window displays. Over the years Patten Studio had the pleasure to work on about a dozen different displays for Barneys windows. The fashionista’s dream lava lamp consisted of four clear glass panels that circulated dyed glycerin and mineral oil using hydraulic pumps. The continuously evolving interplay of these viscous liquids created forms evocative of Proenza Schouler’s intricately woven fabrics. A sheet of mylar draped over a large speaker and custom parabolic reflectors bounced light from bright red LEDs onto the wall. As the speaker plays back sound, the mylar on top of it vibrates, creating images of brightly burning flames on the rear wall. 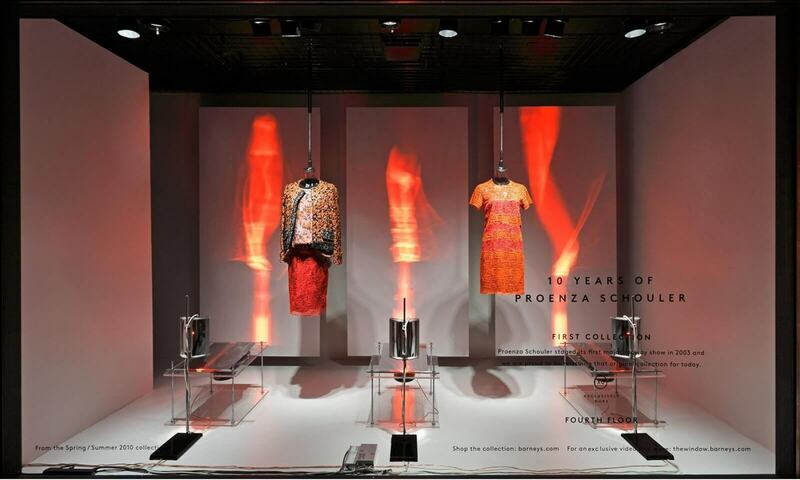 10 Years of Proenza Schouler: The Windows from Barneys The Window on Vimeo. In addition of creating a spectacle for passersby, Barneys leveraged documentation of the production process for their web and social media campaigns.